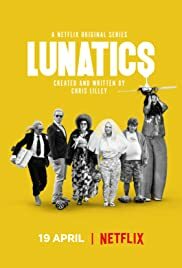 Lunatics: the story of six characters coming to terms with themselves and the world around them – be it a haunting past or a pressurising future, finding love or chasing dreams. Starring Chris Lilley, Chris Lilley, Chris Lilley, Chris Lilley, Chris Lilley, and Chris Lilley. Premieres April 19, only on Netflix.